NETWORK FINALS: The final numbers mostly weren’t kind: there were 0.1 drops for BLACK-ISH, NASHVILLE, STRONG, and the rerun of ARROW, plus MODERN FAMILY stayed at its series low rating. Only THE GOLDBERGS had good news with a 0.1 bump. CABLE HIGHLIGHTS: In the final victory of his NBA career, Kobe Bryant’s ESPN2 game nosed out Golden State’s historic 73rd regular season victory on ESPN, 1.74 to 1.58. (The Golden State game, however, did win with the 50+ demo and the total viewers metric.) The less historic early Miami vs. Boston game was considerably behind at 0.75. The highest-rated non-basketball programming was MTV’s CATFISH, steady at 0.54, with lead-out SUSPECT down 0.08 to 0.27. Bravo’s REAL HOUSEWIVES OF NYC ticked down to 0.43. On Discovery, BERING SEA GOLD remained at 0.39. On Syfy, the finale of FACE OFF jumped a tenth to 0.38, and the finale of THE INTERNET RUINED MY LIFE benefited, up 0.09 to 0.19. On Lifetime, LITTLE WOMEN LA dropped 0.04 to 0.36, and TERRA’S LITTLE FAMILY was at 0.32/0.25, compared to last week’s 0.32/0.30. 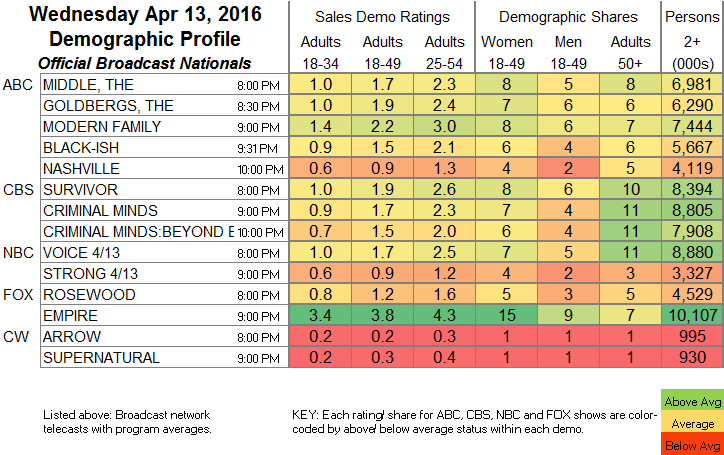 Comedy Central’s BROAD CITY dipped 0.04 to 0.30. WGN’s UNDERGROUND was down 0.05 to 0.29. VH1’s FAMILY THERAPY fell 0.06 to 0.28. On TLC, MY 600-LB. LIFE: WHERE ARE THEY NOW dropped 0.07 to 0.28, and TWO IN A MILLION gained 0.02 to 0.28. 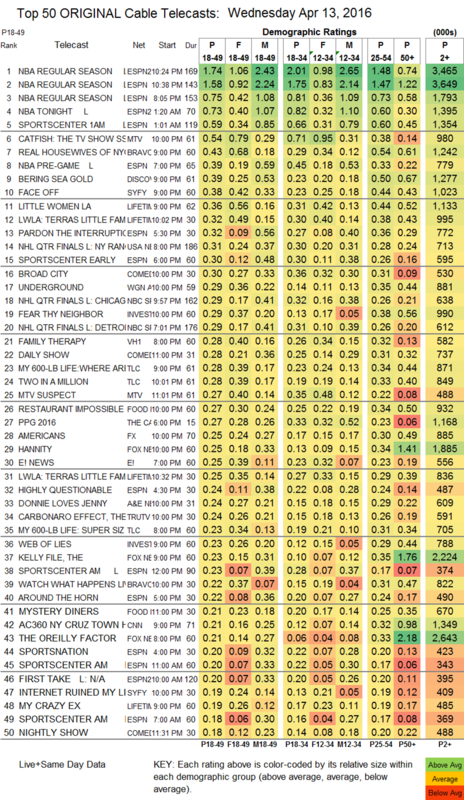 On Food Network, RESTAURANT: IMPOSSIBLE was up 0.05 to 0.27, and MYSTERY DINERS lost a tick to 0.21. After last week’s increase, FX’s THE AMERICANS slumped back down 0.07 to 0.25. On A&E, DONNIE LOVES JENNY was at 0.24, compared to last week’s 0.22/0.20. Tru’s THE CARBONARO EFFECT rose 0.04 to 0.24. On TV Land, LOPEZ slipped 0.02 to 0.13, and THE SOUL MAN fell 0.03 to 0.09. UPDATE El Rey’s LUCHA UNDERGROUND was steady at 0.04/139K in the 1st hour and 0.01/66K in the 2d. POP’s SCHITT’S CREEK was up 0.01 to 0.05/183K. The premiere of Sundance’s THE LAST PANTHERS was at 0.02/78K.